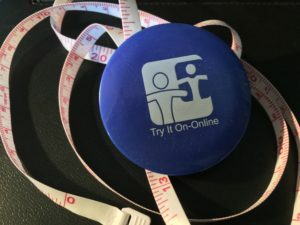 Try It On-Online has a new look! - Try It On-Online, Inc. 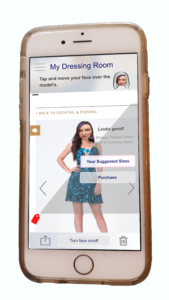 Introducing the redesigned Try It On-Online free mobile shopping app with a new and improved UI/UX for iOS and introducing an Android version. 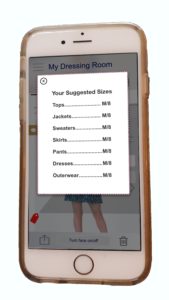 Take the guesswork out of shopping for a size online with this revolutionary app! 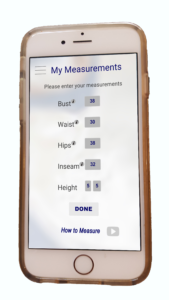 Enter your measurements in the My Measurement screen and let the app recommend a size for you based on your actual body measurements, bust, waist, and hips. Not sure how to take your measurements? Check out our video How to Take Your Body Measurements and we’ll show you how to take your own measurements with a tape measure and a full length mirror. My Shopping Mall has grown from 40 to over 100 stores with links to each store on the app. Shop your favorite department stores, Nordstrom, Macy’s, Bloomingdale’s, or select one of our designers, Ralph Lauren, Alice & Olivia, Nic+Zoe, select an item and save it to My Dressing Room. There is no limit to the number of clothing items that you can save. Press the tab, Your Suggested Sizes, to see recommended sizes based on your actual body measurements, bust, waist, and hips. Those measurements will also tell you what your body shape. Your very own personal shopper tells you whether or not the style you have selected is a good look for your body shape or if you should continue looking for your best style. Press the tab, Purchase, and you are taken to the retailer’s website where you can enter the recommended size and your shipping and credit card information. The retailer handles credit card transactions and shipping: Try It On-Online, Inc. does not have access to your personal information, items you have purchased or credit card information.